1. Prepare outdoor grill for indirect grilling over medium heat (about 400°). Sprinkle bottom of rimmed baking pan or rimless cookie sheet with cornmeal. Carefully transfer rolled out dough onto baking pan over cornmeal. Carefully slide dough onto center of hot grill rack. Cover and cook 4 to 5 minutes or until bottom of crust is lightly browned, rotating once halfway through cooking. Transfer crust back to baking pan. 2. In small bowl, combine garlic and oil. Brush crust with oil mixture. 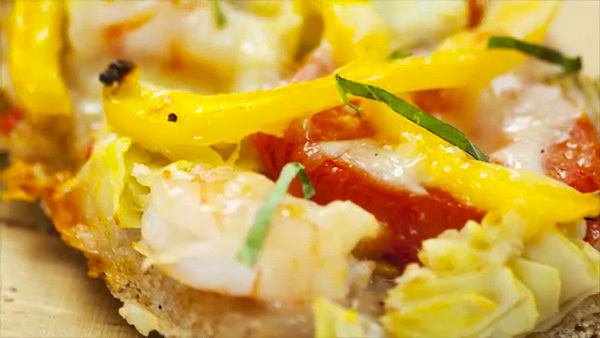 Leaving ½-inch border, top with tomatoes, shrimp, artichokes and bell pepper; sprinkle cheese over toppings. 3. Slide pizza onto hot grill rack. Cover and cook 8 to 10 minutes or until cheese is melted, moving pizza crust if necessary to prevent crust from burning. Transfer to cutting board and sprinkle with basil and pepper; cut into 12 pieces. Sprinkle pizza with crushed red pepper flakes for additional flavor. To prepare a gas grill for indirect grilling, preheat grill with all burners on. Turn off one of the burners for a two-burner grill, or the center burner for a three-burner grill. 1. In large bowl, whisk together flours, salt and yeast. With wooden spoon, stir in water, honey and oil until dough begins to come together. With hands, knead dough in bowl 1 to 2 minutes or until dough is gathered into a ball; dough will feel sticky. Cover bowl tightly with plastic wrap and let stand in warm place 45 minutes or until dough doubles in size. 2. Flour work surface. Transfer dough to work surface; cover loosely with plastic wrap and let stand 5 minutes. (This allows the dough to relax, making it easier to roll out.) Flour top of dough and rolling pin. Roll dough into 12 x 16-inch rectangle. Dough can also be divided in half and rolled into two 12-inch rounds.